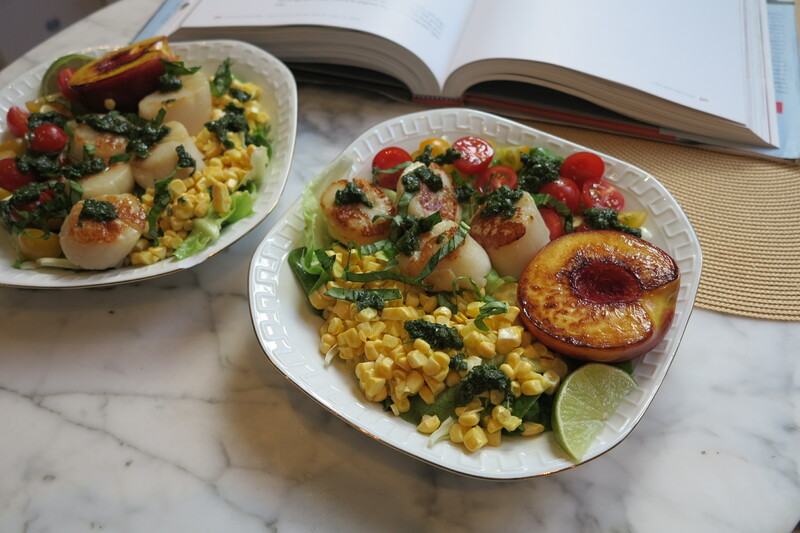 This week I am getting back on track with my French Fridays with Dorie switch up by making last week’s recipe, Warm Scallop Salad with Corn, Nectarines, and Basil. Some weeks you just need a gimme, and last week was one of those weeks, so Carrot Salad it was. Despite the fact that my fellow Doristas seemed to unanimously love this salad, I was still a little skeptical. While all of these ingredients are ones that I love separately, I was not entirely convinced that they would all come together into a cohesive dish. It also sounded like it had the potential to be too sweet with all that corn and fruit. But I set my doubts aside and dutifully set about making this dish. And, as usual, I was happy that I did. I think I recall reading last week that someone described this dish as ‘summer on a plate’ and I would agree with this description. 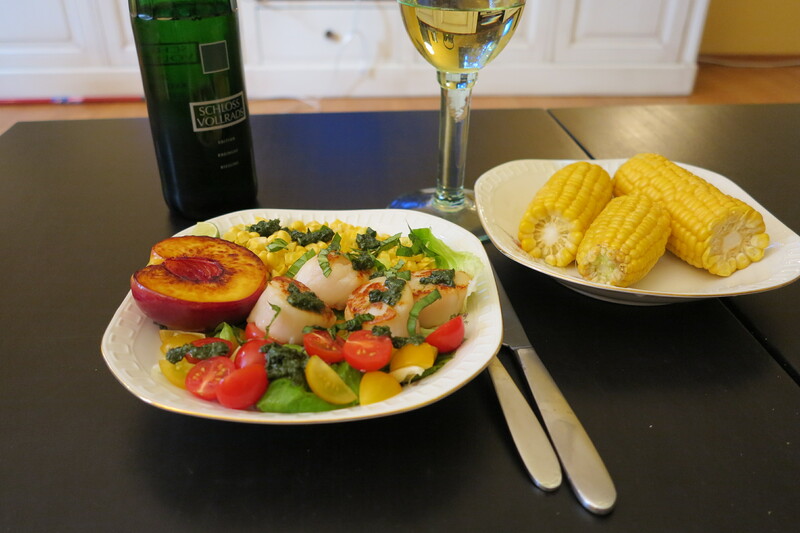 I loved the scallops, I loved the corn, I loved the nectarine, I wasn’t crazy about the lime dressing but it would be easy enough to substitute another one next time. And I particularly loved the basil coulis. In fact, Dorie’s herb coulis recipe has been a brilliant addition to my favorite tricks for pepping up just about any dish. I’ve made it with mint, cilantro, and now basil, and it’s just such a quick and simple trick for adding a bit of flavor. Now that I have caught up with the rest of the group I am looking forward to next week’s recipe which, by my calculations anyway, will be French Fridays with Dorie’s 100th! Crazy huh! And how appropriate that it will be a dessert. This entry was posted in french fridays with dorie and tagged Around my French Table, salad, seasonal - summer, shellfish. Bookmark the permalink. I can’t believe that next week is 100 recipes… Hmmmm. Now I am really going to have to think about that post. Yes, summer on a plate indeed 🙂 Glad you enjoyed! Re the 100th recipe – I can’t quite believe it!!! Your salads look fabulous!! I’m actually taking a day off (yay! ), so will make the carrot salad today between my cupcake baking! I know, it’s hard to believe the 100th recipe (though to be honest, it’s probably only like my 85th or something – I should check!! Beautiful job on your salad. Lovely! I’d rather re-do the scallop salad again than make the carrots for this week. So, I made chocolate cake instead. Great looking salad! I made my Scallop Salad late but posted it on tuesday! It was incredibly delicious…a huge hit in my house! Yours looks perfect and very pretty, too! It looks great Rosa, and so glad that you took the plunge and made it. Most of the time, I like the recipes in this book, with a few exceptions (including the zucchini tagliatele later this month – ewwww). This Scallop Salad looks wonderful to me and your presentation of this pretty and colorful dish is very nice! Although I did not make this recipe, I made the grated carrot salad, it was nice and easy and since we eat a similar salad once a week, we loved that recipe. Have a great Sunday (stay in the shade if you can)! This salad looks sooo good! But I really had to put it off till nectarines are back in season. Can’t wait! I loved this salad way better than the carrot one. Summer on a plate is the perfect moniker. It looks perfect. I really can’t believe the next one is #100. Hope you have a good week. Your salad is plated so beautifully, looking at it is making me hungry. I know I love the tomato, corn, and basil combination, but I’m still on the fence about the nectarines and scallops. Sometimes I think they’re a great addition, and sometimes I think the salad was a bit muddled. Either way, I definitely enjoyed it. I’m glad you did too. Scallops and I had a terrible rendezvous many years ago and I haven’t been able to get near one since. So, I skipped the scallop salad and made basil salt!!! Well, someone had to do it. In hindsight, I think I missed out by not putting the “summer on a plate” together and just adding something else on top. There were so many good parts to the salad, as you pointed out, so I think I will go back and do a do-over with some kind of scallop variation. Your Post sorta pushed me over the top about doing that. Nicely done.